A strange thing happened last year when the Liberal Party decided to use the slogan “End The Waste”. It seems somebody forgot to tell Barry O’Farrell. One of Barry O’Farrell’s election promises was to get cracking on the North West Rail Project, which is rapidly turning into the NW Fail Link. The purpose of the Fail Link, is to give easier access to the city for approximately 300,000 residents of the North West, going by NSW Govt Figures in the Fail Link brochure. The reality is though, that it is taking these 300,000 people and dumping them at Chatswood station, where they will need to change trains to join what is arguably the most congested rail line in Sydney already, the North Shore Line. More services cannot be added to the North Shore Line during peak hours, as there is only a single track in each direction crossing Sydney Harbour. Any mention of building a second harbour crossing before the NW Fail Link is started, is met with blank looks at any of the Fail Link information sessions. One comment I got was “It is too early to be looking at service schedules and timetables for the Nth Shore Line as yet”, clearly planning is not a strong point of the O’Farrell govt. 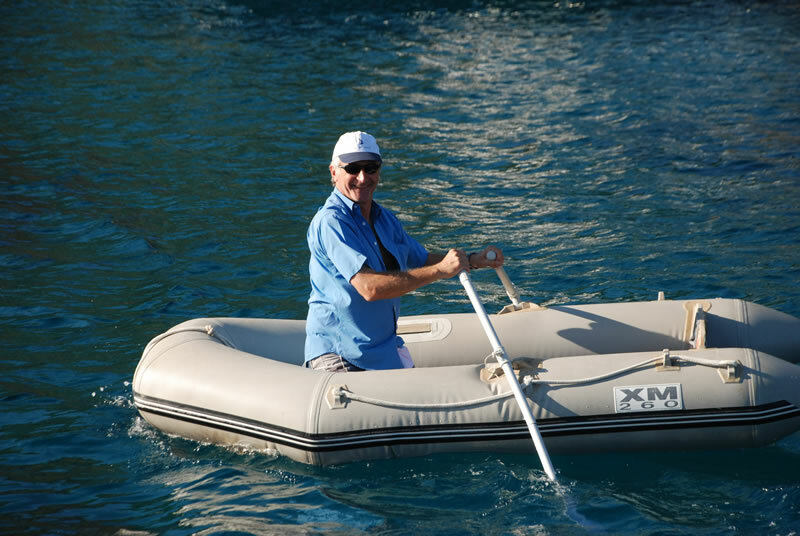 Although strongly denied by the Liberal Party, the O’Farrell govt, and the NSW Department Of Transport, leaked documents show that Transport Minister Gladys Berejiklian, and Barry O’Farrell, may have come up with a low-cost solution to the harbour crossing issue. Details have been sketchy, but a picture has been leaked to some members of the press. The NW Fail Link has yet to have any construction started, and as I’ve pointed out, planning has not really been a stand out. However this has not stopped Barry O’Farrell and Gladys Berejiklian spending an absolute fortune of taxpayers money to promote, what can only be described as a pipe dream at the moment. When I asked for details of expenditure from the Dept Of Transport, and asked if a cost benefit analysis had been done on any part of the project, I was given a mountain of red tape, and told it wasn’t available. We will start with the Information Centre at Castle Hill. To promote the NW Fail Link, and provide information on its progress (remember it is yet to start), an information centre was opened June 29 2011 at Castle Hill to much fanfare. This involved the Govt leasing a shopfront in busy and expensive Castle Hill, fitting it out with lots of displays and interactive equipment such as iPads. Then of course, there is the cost of staffing the centre for 6 days a week, there is always a minimum of two staff on duty at the centre. Knowing the cost of leasing in the area, also knowing the cost of fittings, and staffing, I would suggest that the overall cost of this centre is exceeding a million dollars of taxpayer money, maybe more depending on the length of the lease. The centre, by the figures provided by the minister herself, attracts less than 36 visitors a day. 36 people? When you consider also that this is an average figure, and included in that average is the opening day when half of the Liberal Party showed up, and all of the press were there. It would be interesting to see the number if that event were not included. What a hideous and irresponsible waste of money and resources. Because the NW Fail Link Information Centre has been such an abysmal failure, the O’Farrell govt have had to hold 8 information sessions for the public, of which there are 3 remaining. To highlight the absurdity of it all, 2 of these sessions are held in Castle Hill, a stones throw from the NW Fail Link Information Centre. These sessions involve the renting out of premises, and based on the one I attended at Rouse Hill last weekend, the hiring of approximately 10 staff. The staff do not work for the govt, they are hired from a temp agency, and are given a NW Fail Link T Shirt (another expense) to wear while encouraging people to go in and have a look. The demand for information in the area is so great, that the govt has had to hire people to drum up interest. Whilst at the information centre, I looked at the displays, and picked up 2 handouts on the Fail Link. As you will see from the picture below, one of these is rather huge, it is bigger than my Sunday paper. This spiral bound book is printed on high-grade, thick, glossy paper, and is 49 pages in size, not including the cardboard front and rear cover. I asked at a local printer how much to have one of these made, and was told over $20 each. I am assuming as the govt would have had thousands printed, they would have been cheaper than that, but even at half the price, that is a staggering amount of money to spend on something that most people will throw in the bin, there were several in the nearby bin at Rouse Hill…. 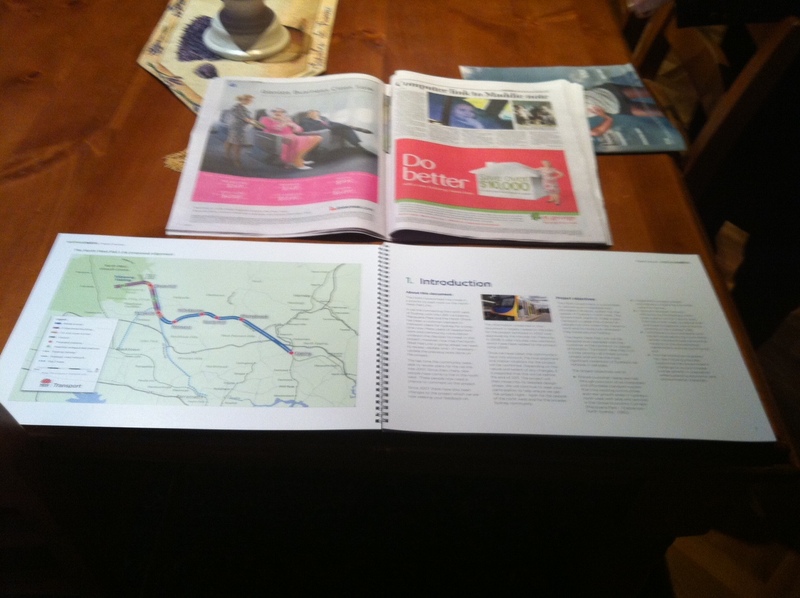 Surely the smaller foldout info sheet with the map, also pictured below would have sufficed. But not for Barry, spend up big Barry, we need the landfill…. 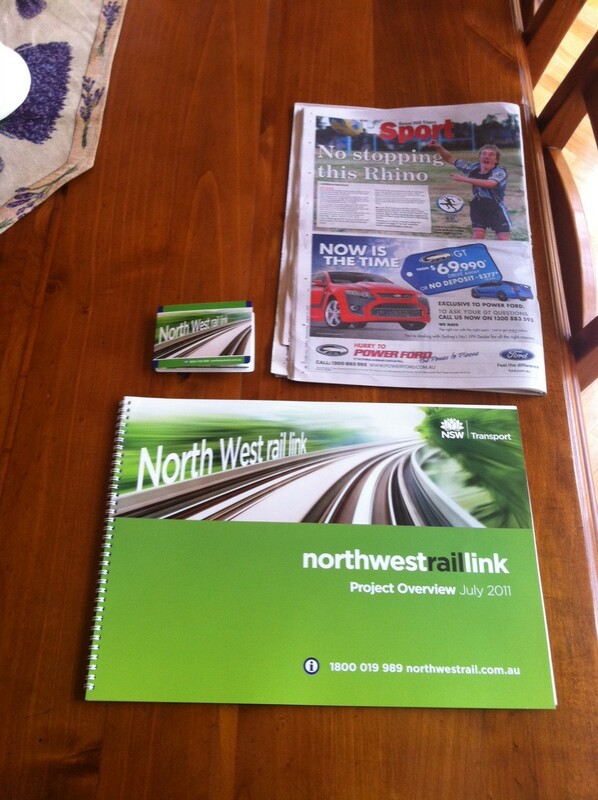 On top of that, there is the website http://northwestrail.com.au and the information hotline which is printed on all the handouts, and shown on the website 1800 019 989. I have no problems with a website and a contact number, although maybe they are a little premature. Info could be on the Department Of Transports web page, but that is not really an issue. What is an issue however, is that the staff at the info line are relatively clueless. When I spoke to one of the ladies, and was asking about connecting transport for schools etc at Rouse Hill, which is the main station, it was quite apparent she was struggling, not long after, she admitted to not even knowing where Rouse Hill was in Sydney. That was odd I thought, given you would assume the people providing information would have some local knowledge, so I asked where she was from. Boy, was I in for a surprise. If you were going to waste money on people who don’t know the area Barry, you may as well have hired a team from the North Pole. Somebody should resign over this, who is it going to be Barry, you or Gladys? You clearly have Victoria’s best interests at heart, or you would have hired staff in your own state. You remember us don’t you Barry? New South Wales, does it ring any bells? Clearly there is waste in New South Wales. It is called the O’Farrell Government, and it a colossal waste of space. This entry was posted in North West Rail Link, Politics. Bookmark the permalink.